Escape the bustle of Buenos Aires to explore one of the world’s largest deltas on this half-day tour to Tigre and the surrounding Parana Delta. 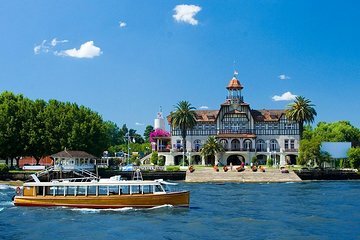 Ride in a traditional boat through the many canals and rivers that snake through wildlife-rich wetlands, and get a glimpse of river culture on a bus tour of the lovely suburb of Tigre including highlights like Paseo Victoria and the Tigre Art Museum. Pickup from central Buenos Aires hotels makes this an easy wait to get outside city limits. Very boring - the boat ride was ok nothing special and then you are taken to a tourist trap market where you are asked to spend more unwanted time. Amazing! Highly recommend. Your spouses will enjoy as apart from cruise ride lot of local shopping can be done. The guide's English was above borderline. There were many more Spanish speaking folks on board. The town El tigre is nothing to write home. But the Delta is a geographic marvel. Tigre y Delta is such as rare place, but it definitely a must do! The tour was great! We really liked this tour. The pickup was easy, right from our hotel, and then we drove straight to Tigre. There was a brief tour by van around the town, and then we went to the dock to get on the boat. The boat trip was relaxing, with great weather, and we had great views of the houses along the river. After the boat trip we drove to the flea market and spent about 40 mins browsing. Then we drove back to BA and were dropped off in a central location. It was a nice day outside the city and the tour was well organized.